I love finding something from half a century ago and learning more about it. This week, that something happened to be a bunch of DAV tags from the Disabled American Veterans Ident-O-Tag program. 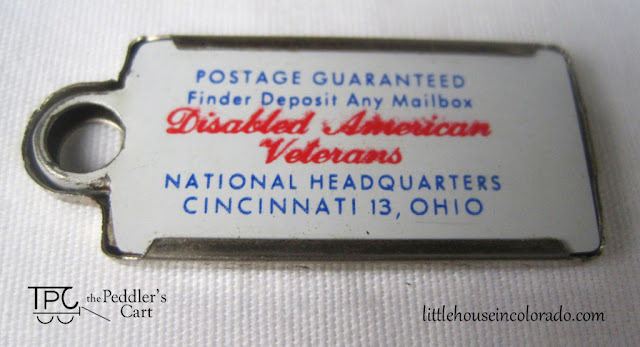 From the early 1940’s through the mid 1970’s the Disabled American Veterans (DAV) offered Ident-O-Tags to people through the mail. 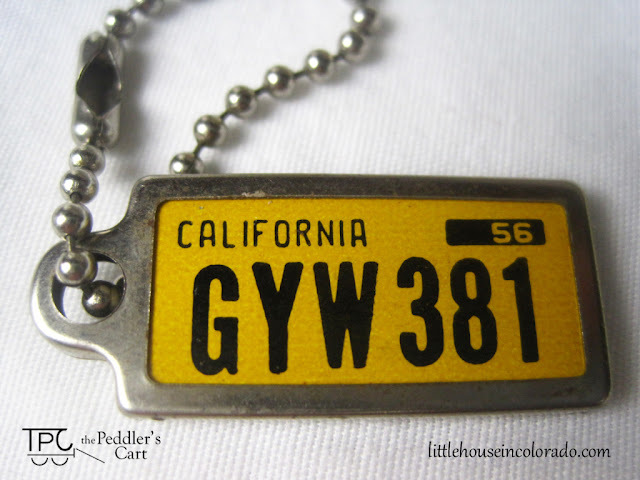 The tags were keys chains resembling their own personal vehicle’s state license plates. For a small fee (only 25 cents in the 1940’s), your keys would be registered with the DAV. If the keys were ever lost, a good Samaritan could drop the keys into any mailbox, they would be sent to DAV headquarters and from there be mailed, postage paid, back to the rightful owners. With all the keys people are still losing, perhaps this program should start up again! You can find DAV Ident-O-Tags and other collectibles in our Etsy shop. UPDATE: These tags have been sold. I love Christmastime. The decorating and caroling. The increased happiness and goodwill. 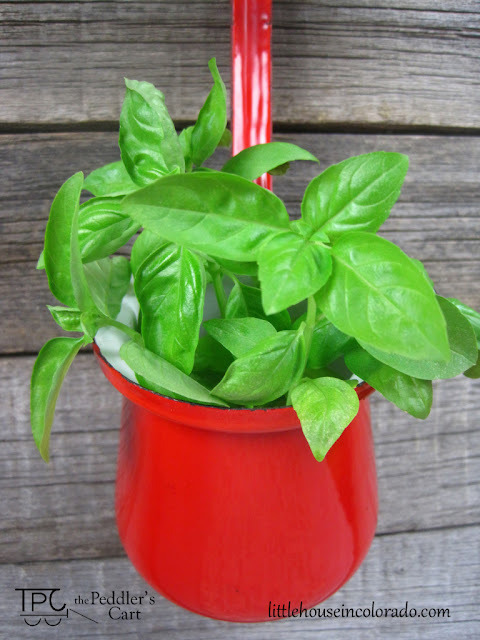 The purchasing or making of gifts specially chosen for each name on my list. Driving through town and seeing all the homes twinkling bright with Christmas lights. One of my absolute favorites as a child - and one of the few that still has all it's beads still in place. ...or perhaps an older story that has picked up new chapters along the way. 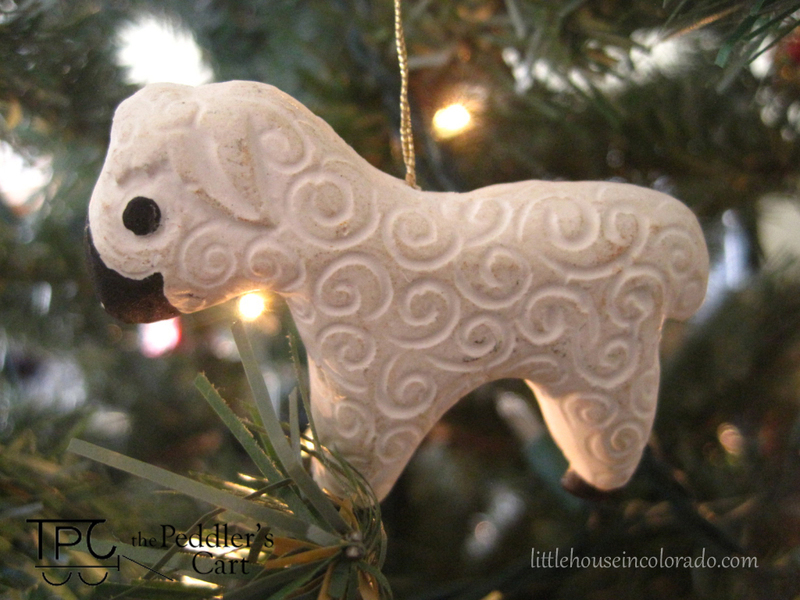 This little lamb ornament was made by my mom when I was a child. When my now-15-year-old son was a toddler, He wanted it and grabbed for it, pulling the Christmas tree down on top of him. Now it's his favorite ornament because of the history it holds. I look forward to unpacking the boxes of carefully wrapped Christmas ornaments. Some are from our travels, but most have been made by my children, myself (as a child and adult) and even by my mom many, many, MANY years ago. The children call them "really old" ornaments. I call them "vintage". 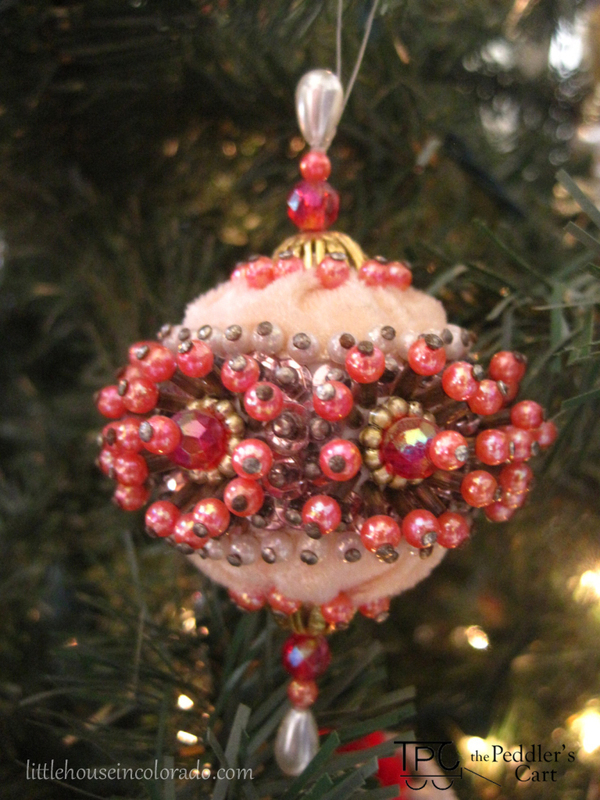 The children have their favorites, as do I, and there is usually a small argument or two over who gets to hang what ornament on the tree. But eventually, it gets done. Our Christmas tree is a very "handmade" looking tree. It lacks the tinsel and ribbon with coordinating glass balls. Instead, every branch is crammed full of our rather large and varied selection of ornaments. 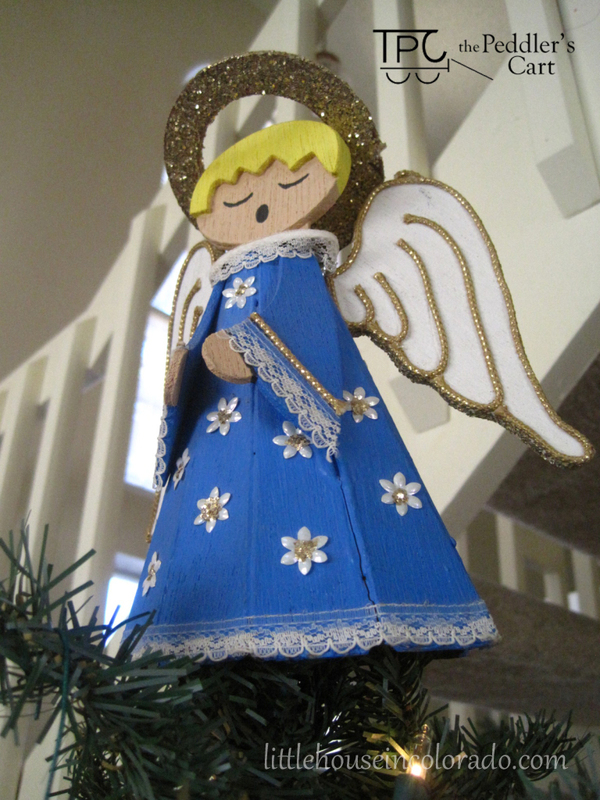 This angel has adorned the top of my Christmas tree every year for as long as I can remember. 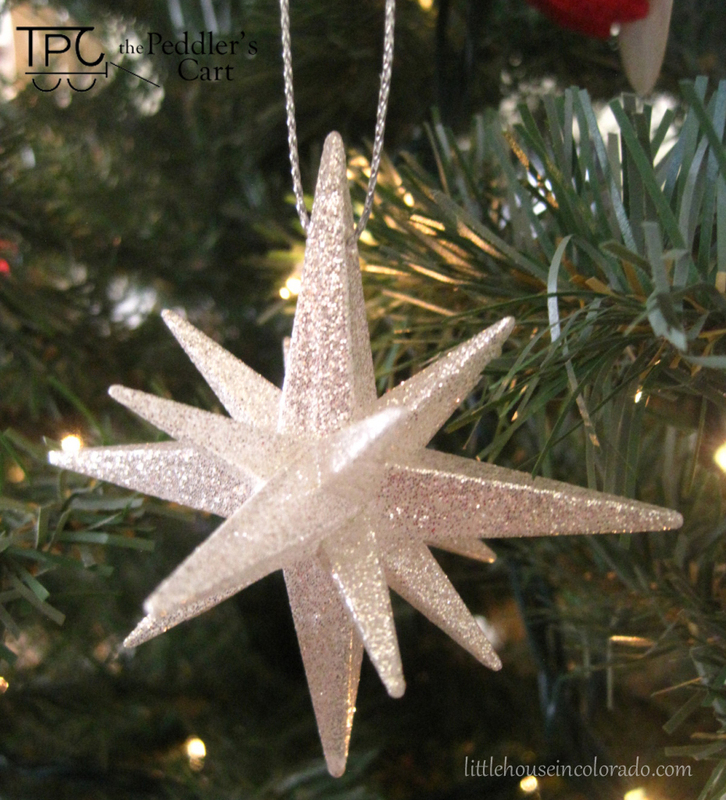 We all stand back and admire it, pointing out all the ornaments and re-telling their stories. You can find vintage Christmas ornaments available for purchase in our Etsy Shop. I was one of those eighties kids that had a denim jacket covered in buttons...and I loved it. Some of the buttons were colorful. Some were sarcastic. Some were just plain cute. 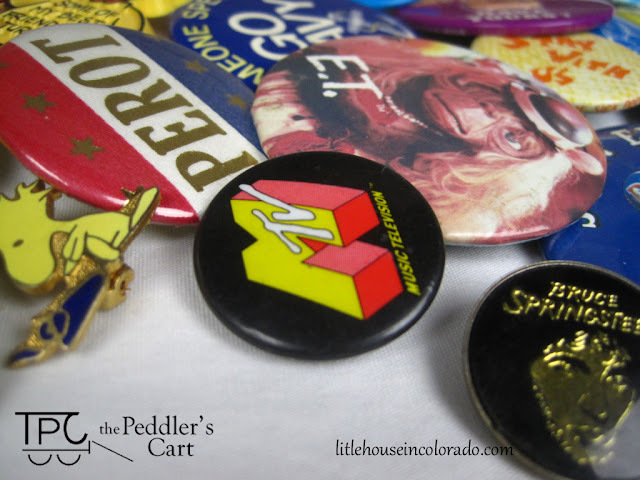 Being a shy, awkward teen, my buttons were an outlet for expressing myself. Eventually, I moved away from the buttons. They wound up in a box of stuff that I will probably never discard. 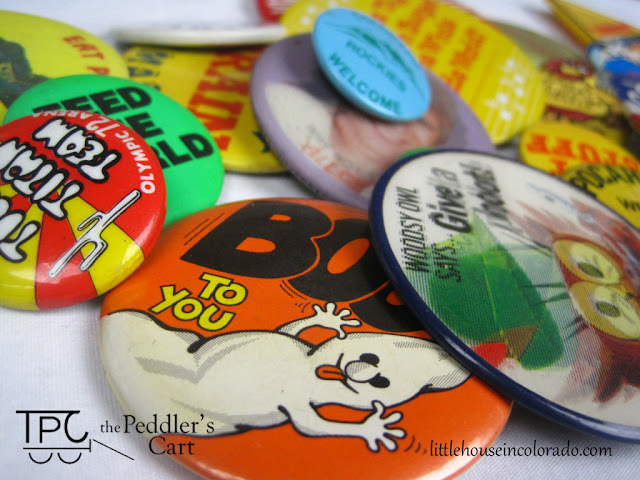 I still have fun rummaging through pinback buttons at flea markets, yard sales and thrift stores. They're common but not exactly easy to find. That's probably because people have quite an attachment to their buttons. We were thrilled to find these buttons recently. You can find them and other pinback buttons in our Etsy Shop! I have no fewer than 20 books in and around my nightstand at any given time. The book shelves are all bulging and still I bring home more books. There are at least 25 moving boxes still full of books from our last move 4 years ago (and they have already been weeded through!!!). You could say I have an obsession with books. 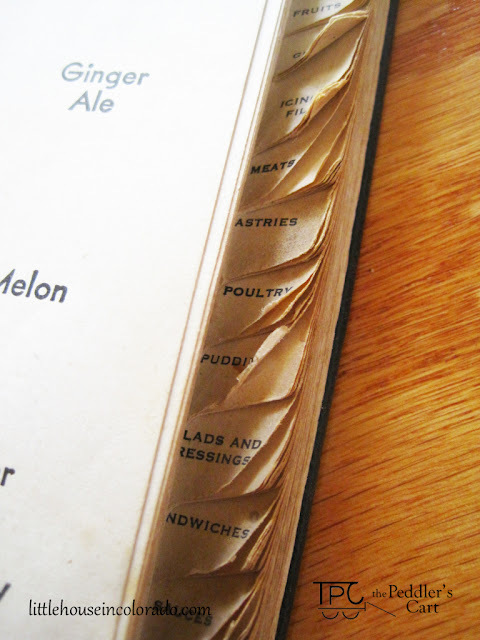 And if it's an old book and I am even more enthralled. And many, many, MANY others. Eventually, they may make it to our Etsy shop. They MAY. And definitely not until after I have already had a chance to read them once or twice. 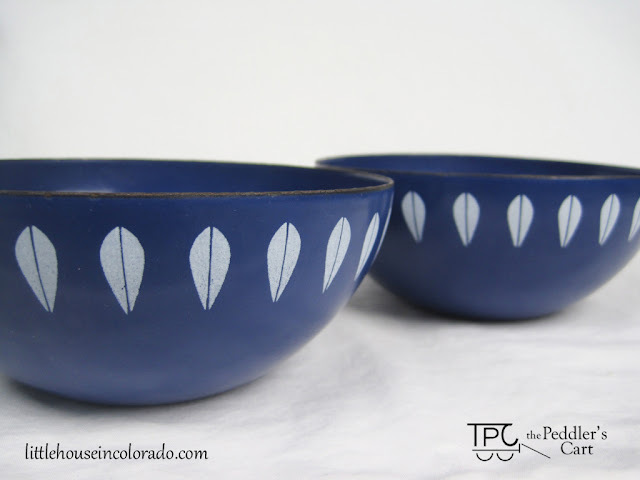 I recently picked up a large set of dark blue Cathrineholm bowls with the recognizable lotus pattern in white circling their tops. 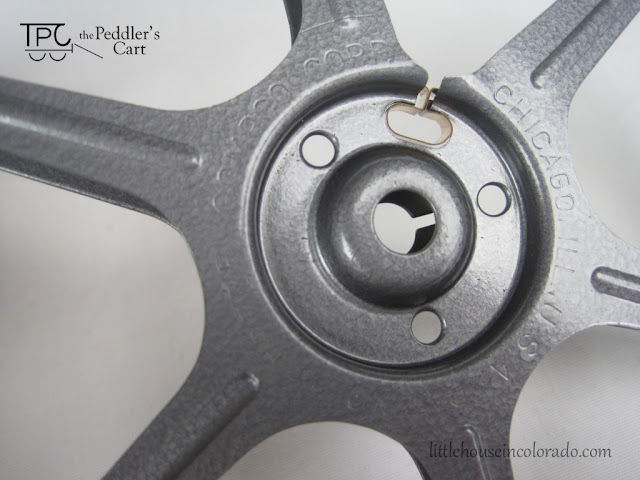 Cathrineholm was founded in Norway in the 1800's as an ironworks. 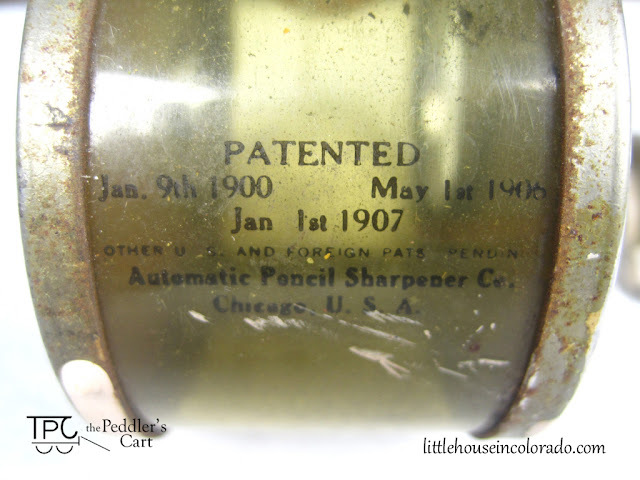 They later began making enameled cookware. 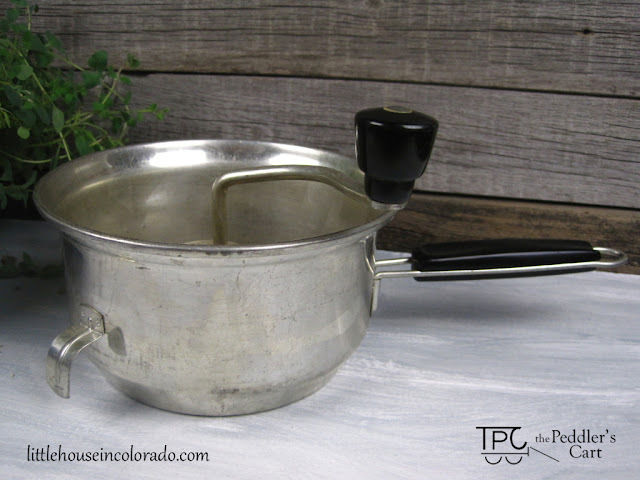 Under the direction of Grete Prytz Kittelsen in the 1950's, Cathrineholm began producing a line of serving pieces and cookware that has become highly desirable. The incredibly popular lotus pattern is credited to Arne Claussen. 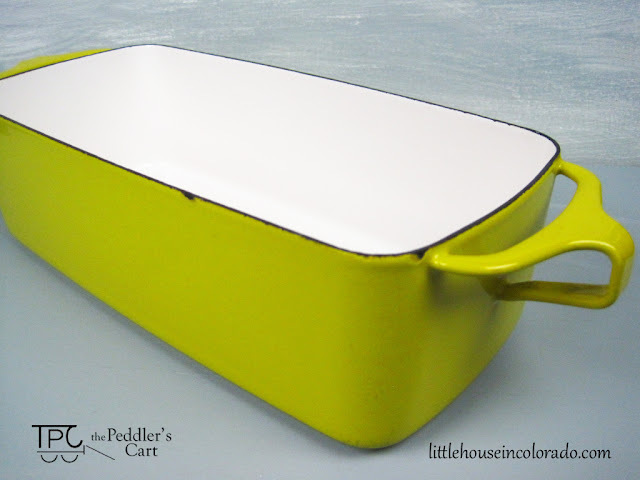 Mid-Century modern and Scandinavian pieces appeal to me but while I usually lean more towards Dansk enameled cookware (because of their unusual handles), I'm beginning to feel the pull of Cathrineholm serving pieces with their bold colors and simple patterns. 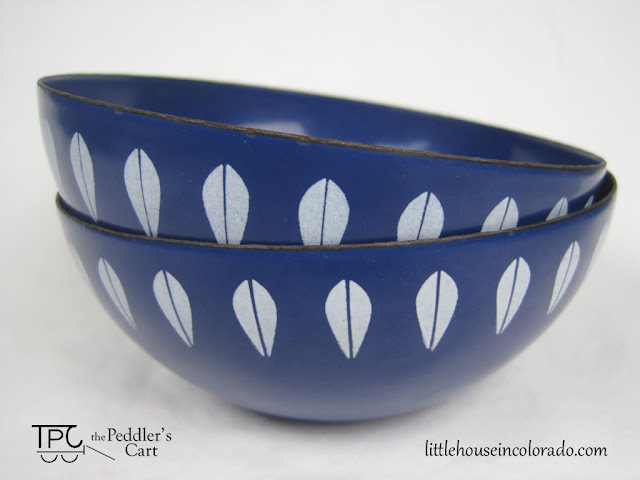 You can find these Cathrineholm bowls, as well as other kitchen and dining pieces, in our Etsy shop. Update: These bowls have been sold. Did I mention when I was rambling on about Paddington Bear that I also had an addiction to Hello Kitty as a child as well? I did. I still do, though it's not "quite" as bad as it was. Back then (in the 1970's and 1980's) you couldn't find most anything your heart desired with Hello Kitty attached to it. There weren't SANRIO stores at the mall. You could only get stuff like stationary...actually...ONLY stationary...pens, pencils, notepads, pencil sharpeners, stamps and little erasers. And only in special stores. Perhaps my family just didn't shop at the right stores to purchase anything other than Hello Kitty stationary, but that's all I could find. Apparently, things were different in Japan. 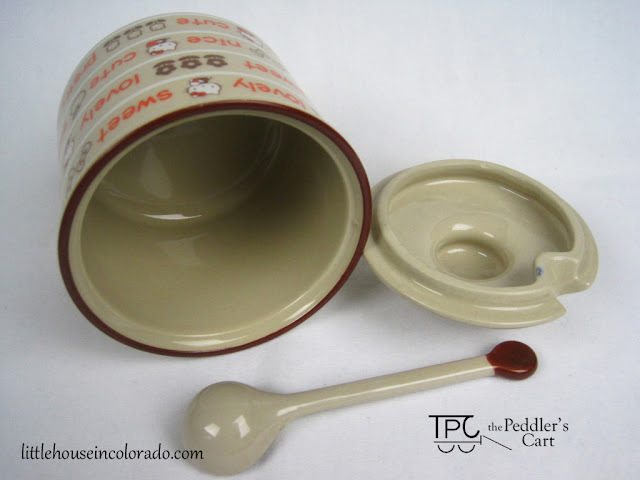 A quick search online will bring up all sorts of vintage Hello Kitty items.I found this Hello Kitty sugar bowl (sugar pot?) 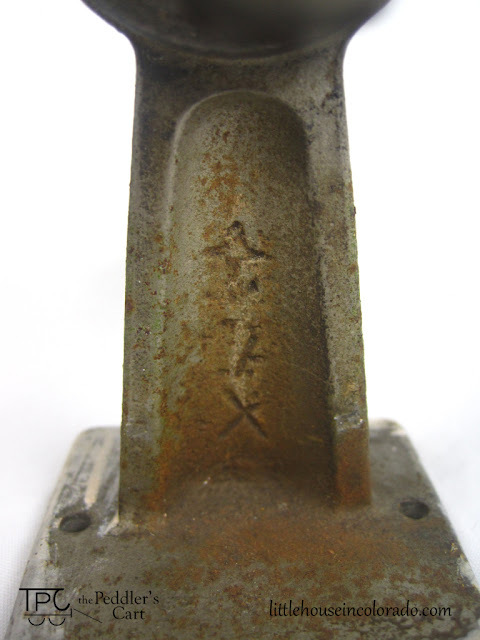 that was made in Japan. 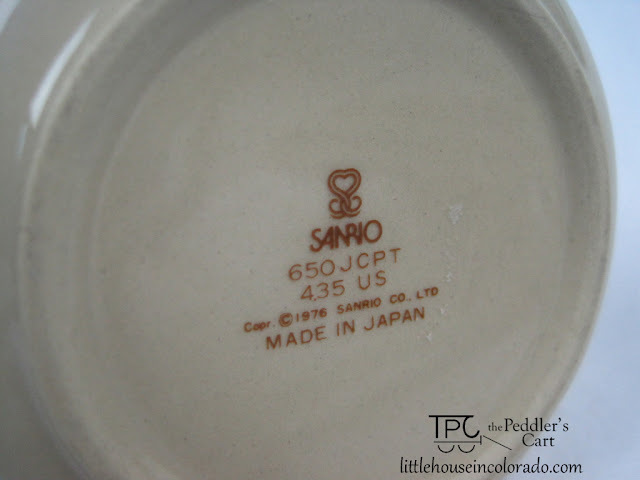 The mark on the bottom says © 1976 Sanrio. I've never seen one before. I may never see another one again. It even has a tiny spoon! I'm sure as soon as The Girl spots this, she'll plead with me to keep it (she loves Hello Kitty, too). 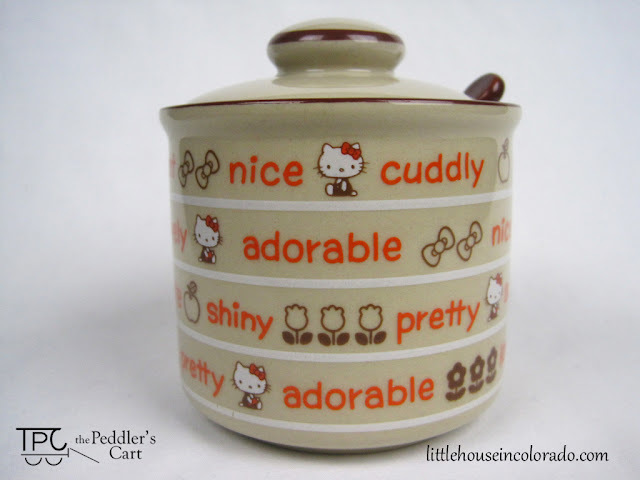 You can find this Hello Kitty Sugar Bowl along with other vintage kitchen and dining items in our Etsy Shop. 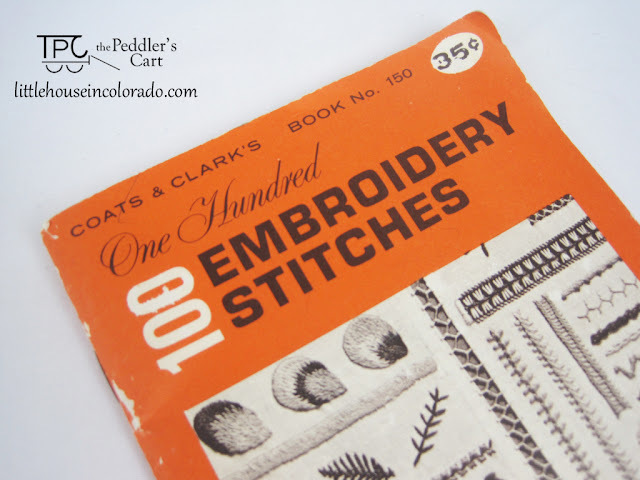 Update: This item has sold but you can find other vintage items available in our Etsy shop! Peter didn't mean to make me a crazed lunatic. It was completely innocent. By "Peter", I mean Peter Rabbit (of course). 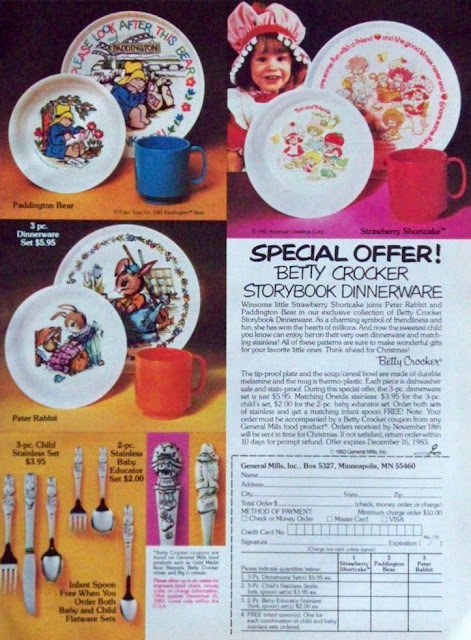 Betty Crocker not only sold the Storybook Dinnerware, but matching flatware as well...Peter Rabbit Flatware and PADDINGTON FLATWARE TOO!!! Oh, and Strawberry Shortcake flatware for any fans out there. I was never a Strawberry Shortcake kid (though I sniffed those scented dolls more than any child probably should have) but Paddington was another story! I LOVED Paddington Bear! I first learned about Paddington when my cousin and I were children. He was three years older than me and had a bunch of the chapter books. He either let me borrow them or I snuck them away to read. I honestly can't remember which. Paddington and I shared a love of marmalade...sticky, sweet, orangy marmalade. Although I didn't have to worry about it sticking to the fur on my bear paws. And I envied his big ol' hat...big, floppy and bright yellow (or sometimes red). Before my second child was even born, I bought him a plush Paddington Bear. I love Paddington Bear. I want a set of this flatware for myself. It doesn't matter that it is intended for children. I. Want. It. 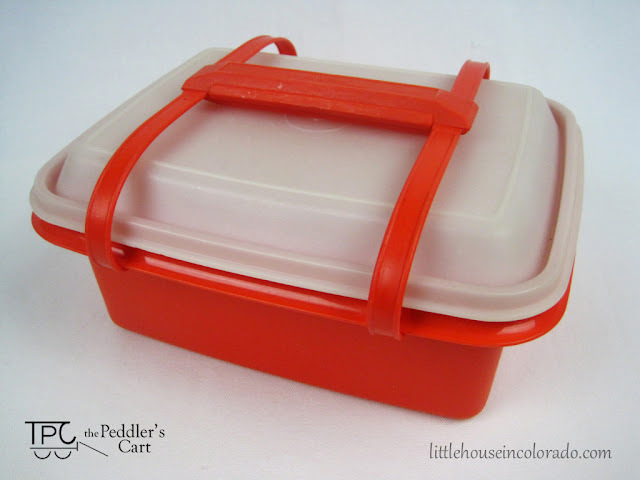 The problem is, Paddington flatware seems to be harder to find than Peter Rabbit Flatware. So now I'm looking. And looking. And looking. That is how Peter made me a crazed lunatic. Looking for something that's hard to find can make you crazy for a bit. Of course, I could just go to Replacements.com and buy some Paddington flatware for an outrageous amount of money ($20 per piece, anyone?) but that would be too easy (and expensive). I'll look for a bargain first...maybe wait for a co-seller on Etsy to find one somewhere. Or perhaps I'll get one of the awesome Paddington spoon rings or bracelets made by another Etsy seller, TheBeadLadiesII. 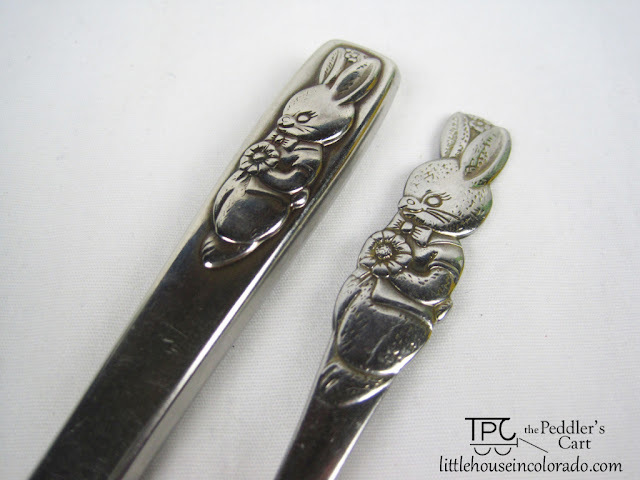 The Peter Rabbit flatware can be found in our Etsy Shop. 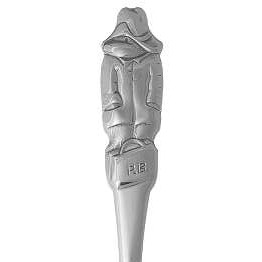 UPDATE: The Peter Rabbit flatware has been sold. 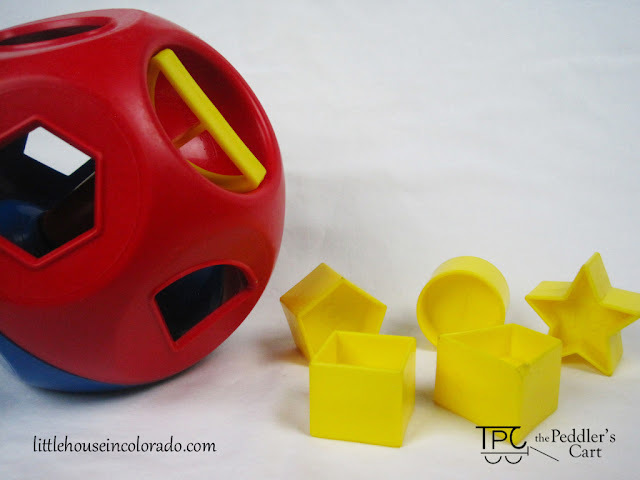 When I became a mother, there were certain things I wanted to provide for my son. Besides a loving home and a close family, I wanted to offer him things that would stimulate his mind. I gravitated mainly towards books. 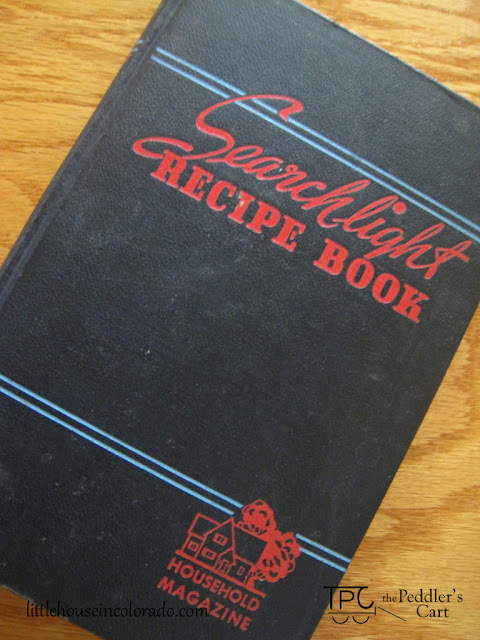 Of course, the knowledge I drew upon was from my own childhood and the books I read. I still remembered all those stories from long ago and wanted my child to experience them as I had. I still had several of the books that I read as a child but they were mostly for an independent reader and not for a very young child. I slowly began to fill in the gaps and create a children's home library. Richard Scarry books and the "I Can Read" books quickly became ideal gifts from family members. 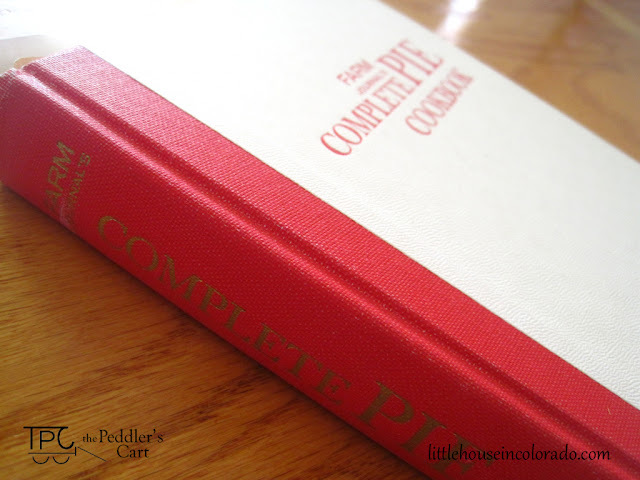 I began to search out and collect Little Golden Books. The first five I purchased were brand new reprints of my most favorite (and possible the most popular) Little Golden Books - The Poky Little Puppy, The Tawny Scrawny Lion, The Saggy Baggy Elephant, Scuffy the Tugboat and Tootle. I read all of these, and many other Little Golden Books, as a child. I read them to my own children when they were young. And I still love to read them today. I find myself flipping through the pages of random Little Golden Books, completely in another world, while I'm browsing used book stores. I get such joy from hearing my youngest child, my daughter who is now eleven years old, squeal with delight when she sees me bring home a new Little Golden Book (even though she pretends she's much too old for such things). And just like her mom, she'll stop everything and read it...even if is a story she has already read many times before. 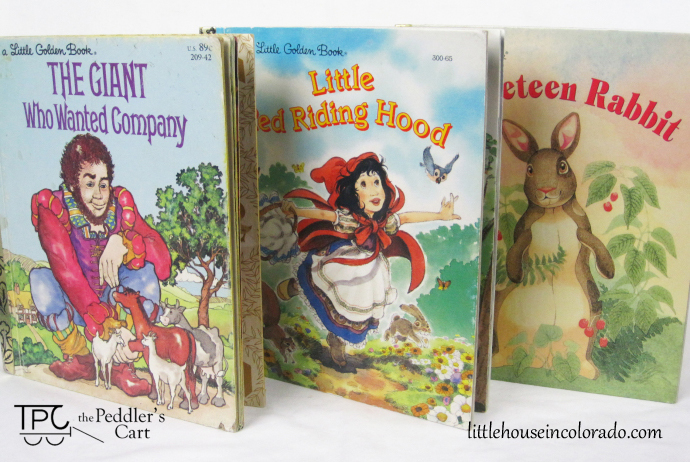 You can find Little Golden Books and other vintage children's books in our Etsy shop. There comes a time in life for all of us when we have to make tough decisions. Some of those decisions can be really difficult and life-changing. I have had my share of those moments...and I still question some of the decisions I finally made. Nowadays, the decision-making moments are becoming much more frequent (though thankfully not nearly as serious). Decisions like what to keep and what to sell. 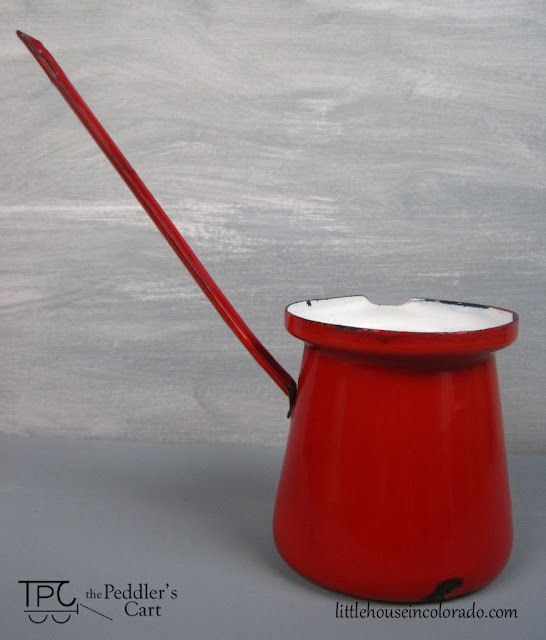 I mean, take this red enameled butter warmer. Although I never could figure out their exact origin and age, it took me several months to decide to go ahead and sell them. I would have been happy simply letting them decorate my kitchen walls. Here is another enameled piece. 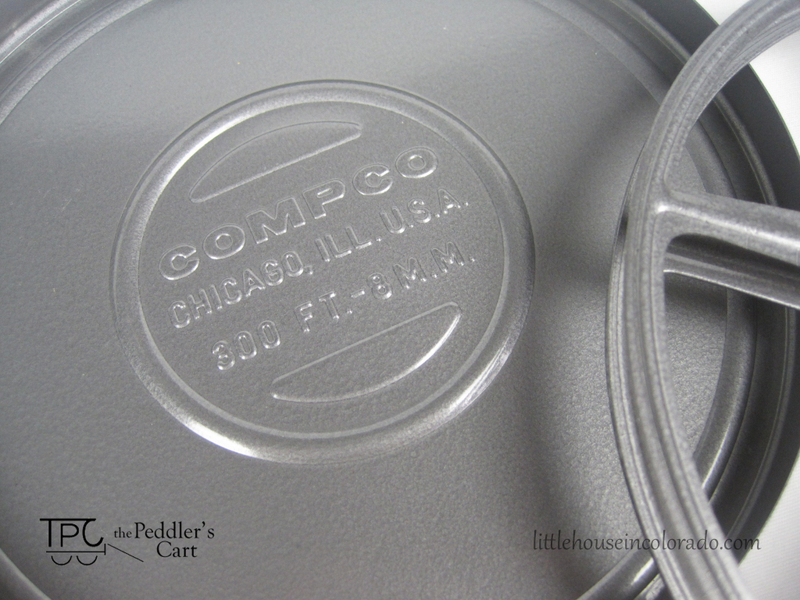 It's the only piece of mid-century Dansk Kobenstyle enamelware that I own. The handles are what attracted me to it. I'd love to acquire more pieces (the turquoise would be lovely). I've had this one for awhile now and haven't used it much, but I can't bring my self to part with it. Sometimes the decisions regarding what to keep and what to let go can be very difficult indeed. From Left to Right: "You're A KNOCKOUT", "Reach out and touch someone...ME!" and "I'm AIMING for your heart"
If I remember correctly, Smurfs are supposed to be three apples high. That seems a little creepy to me...though are we talking crab-apple height or honeycrisp apple height? 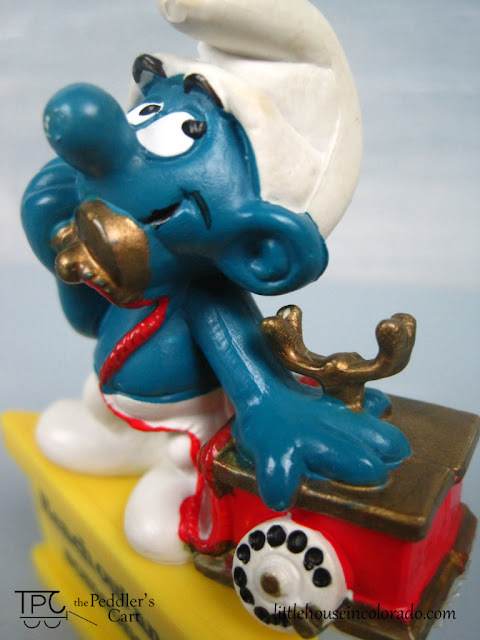 I think I would be more comfortable with smurfs that are three cherries high. 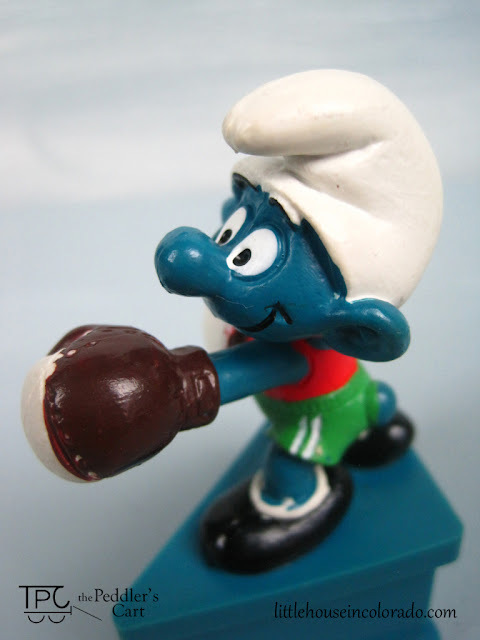 Regardless, I've always liked the smurfs. 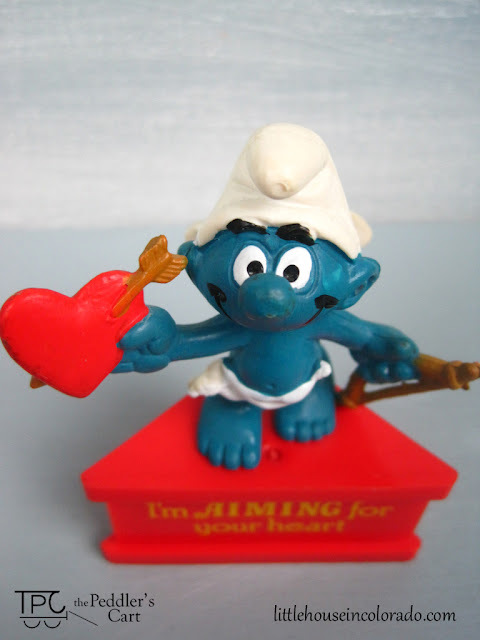 I used to have a handful of them when I was a kid...Vanity Smurf, Handy Smurf, Brainy Smurf and of course Smurfette, among others. It brought a smile to my face to find these familiar blue beings. 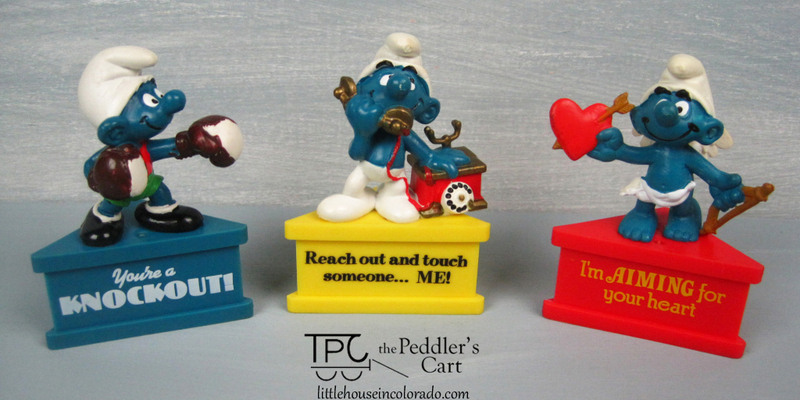 They are Smurf-A-Grams and are currently available in our Etsy Shop. They're a great way to say "hello" to someone you care about! 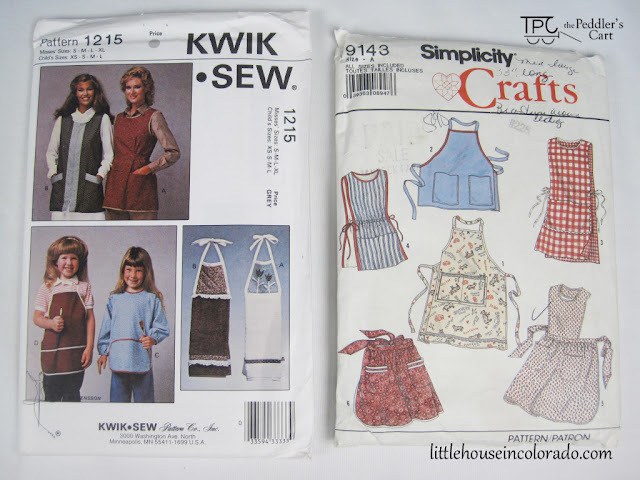 Update: These items have sold but you can find other vintage items available in our Etsy shop! 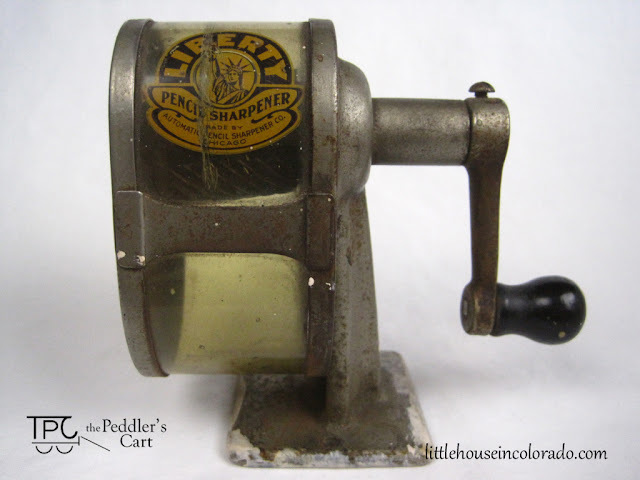 The Foley Food Mill is like a cross between a food processor and a blender, minus the electricity. 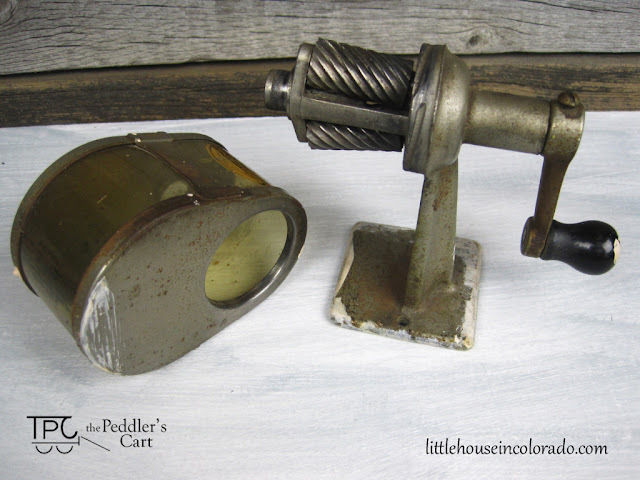 It is an invaluable tool during canning season and is ideal for off-grid settings. 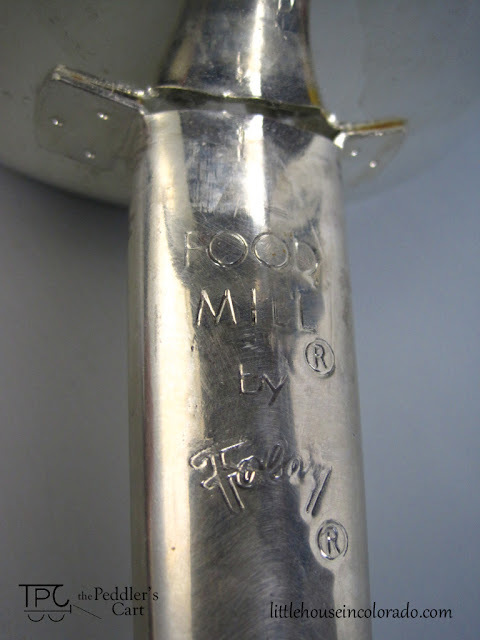 The Foley food mill acts as a manual hand cranked ricer, strainer and masher in one. 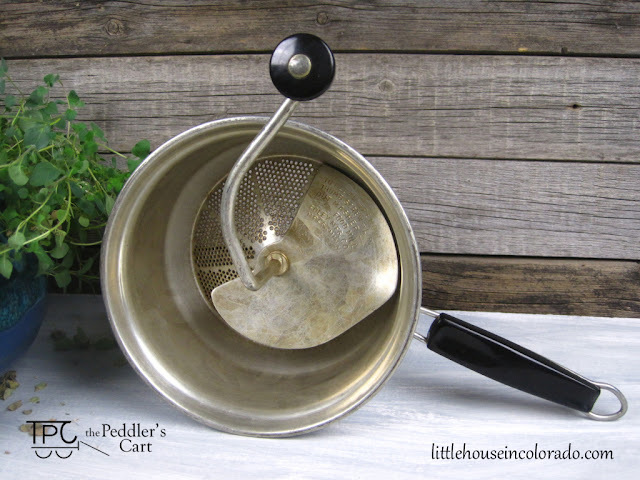 It is the perfect tool for pureeing fruits and veggies and will even remove seeds and skins for you (something neither the blender nor the food processor will do). 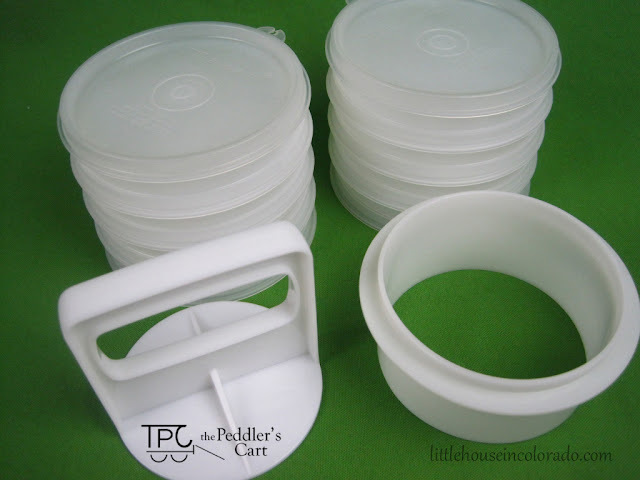 The Foley Food Mill works with soft or cooked foods and makes wonderful applesauce, mashed potatoes, tomato sauce, cauliflower mash and even homemade baby food (THAT would save a lot of money!). I even heard of someone using it to make chili sauce because the chili seeds can’t get through the holes. Brilliant! There is a wire on the bottom that scrapes the perforated grate clean as it turns. 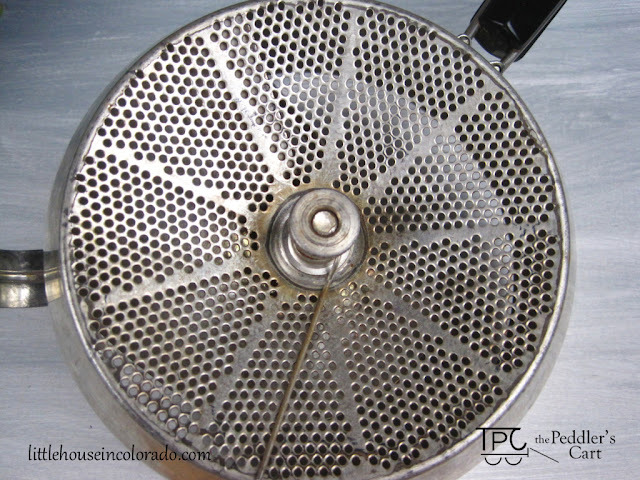 The whole mashing/pureeing mechanism unscrews easily for washing. Two metal pot rest tabs help to hold the food mill steady and in place while you are using it. 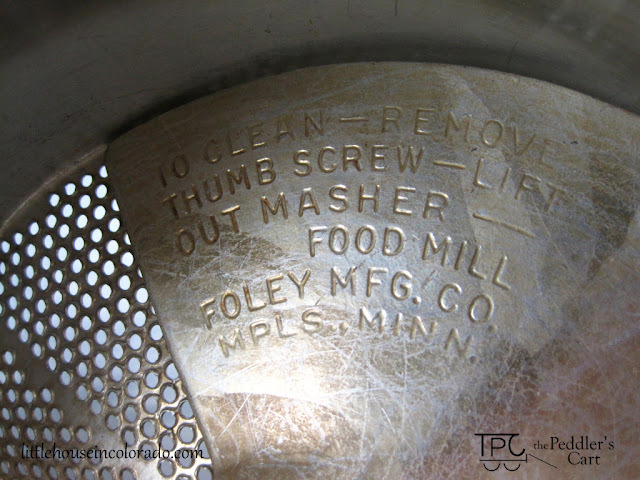 The mashing mechanism turns easily and reads, "To clean - Remove thumb screw - Lift out masher - Food Mill - Foley Mfg Co, MPLS Minn". 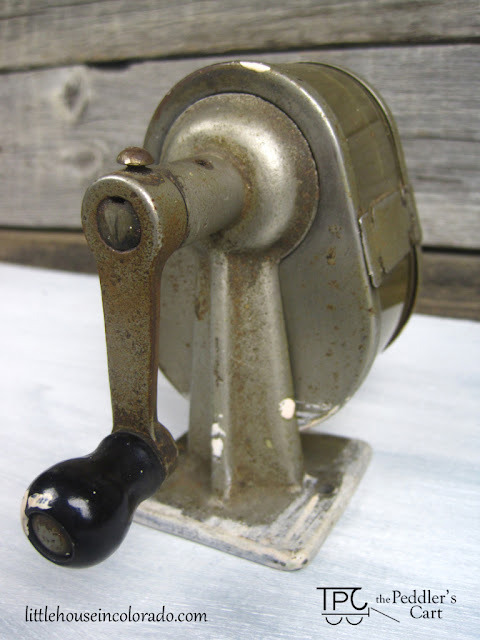 On this version, possibly from the 1950's, both the handle and the knob are of a black plastic (believed to be Bakelite) and makes the food mill very comfortable to use. 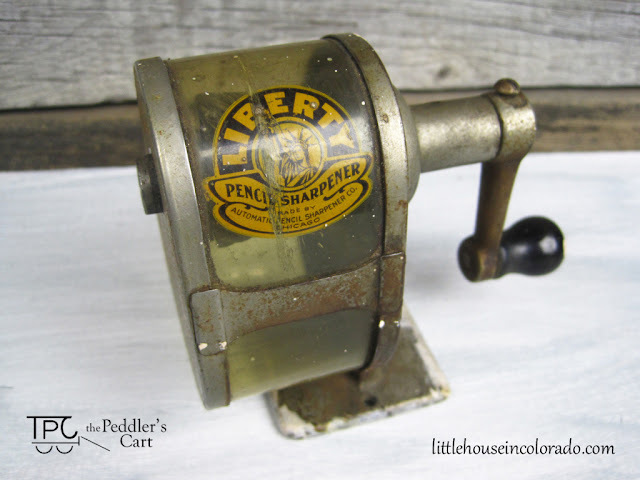 You can find this Foley Food Mill along with other vintage kitchen items in our Etsy Shop. 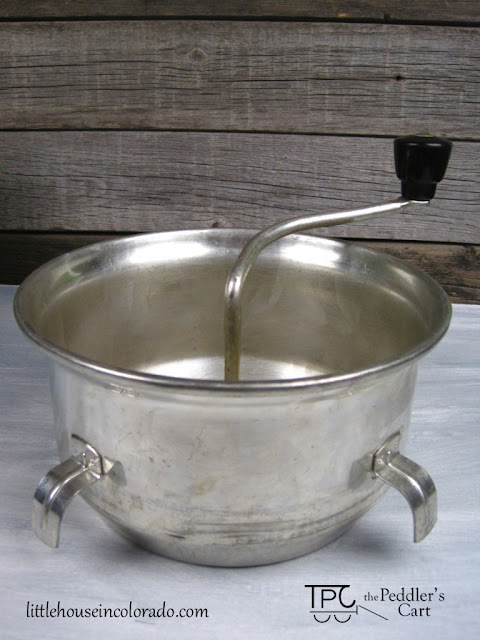 We also have a Foley Food Mill available with the all metal handle which is also quite comfortable to use and reads FOOD MILL by Foley on the handle base. UPDATE: Both of these food mills have sold. 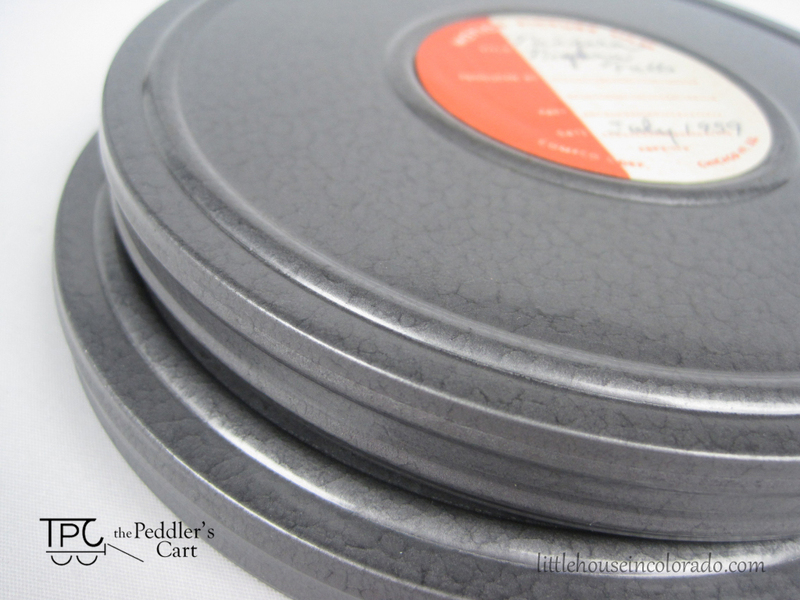 They used to hold someone's home movies from the 1950's, but now these two empty Compco motion picture film reels and their metal storage canisters would be perfect vintage decor for a home theater! The 6" reels used to hold 300 ft of 8mm film. 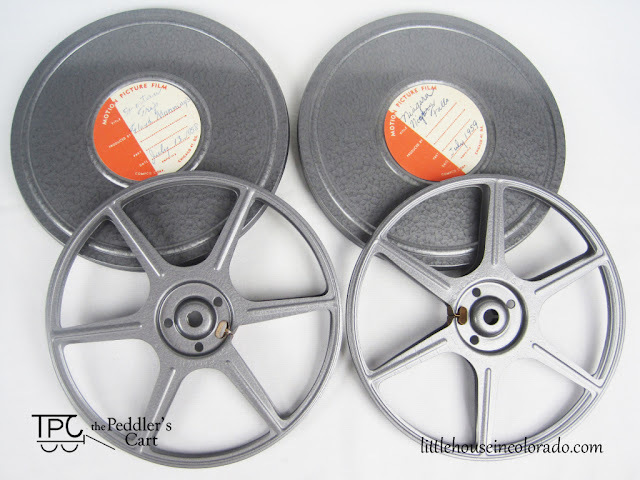 There are no apparent dings or dents and the cases and reels are still shiny and clean. Originally from the Compco Corporation, Chicago, Illinois. 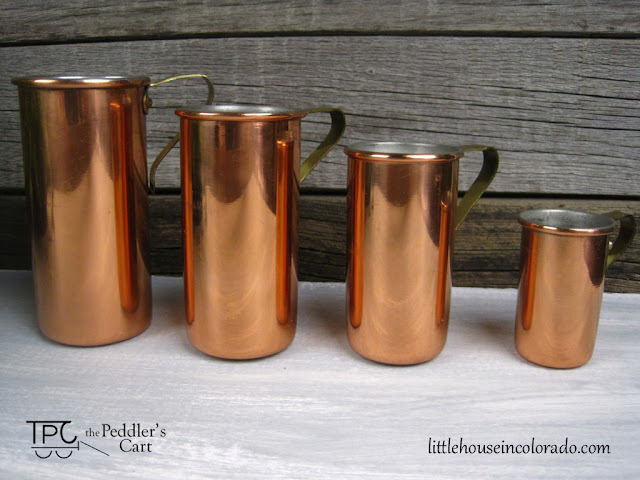 Hang them on a wall or display them on a shelf. 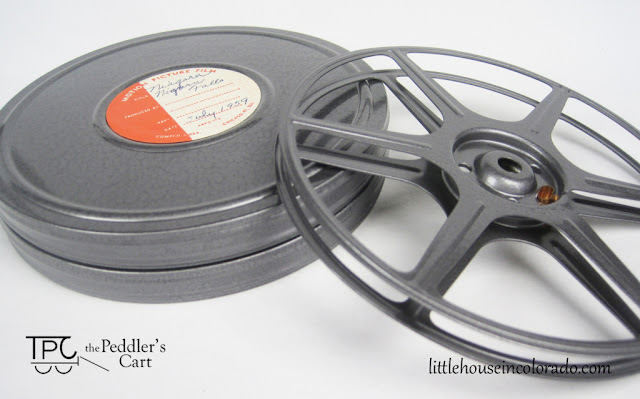 They could even be used a props in your own home movies (student films, anyone?). These film reels and canisters are available for purchase from our Etsy shop. 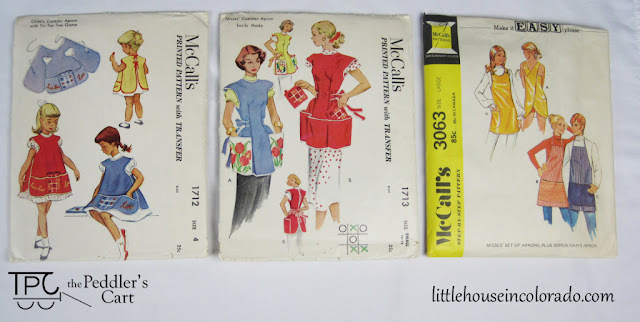 Update: This item has sold but you can find other vintage items available in our Etsy shop!